Drs. Steven White and Brad Haines are currently accepting new patients and offering a special promotion for teeth whitening in Cornelius, NC. Patients who make and attend regularly scheduled twice-per-year hygiene visits to the dentist at White and Haines Advanced Dentistry will receive complimentary, professional whitening treatment for life. Drs. 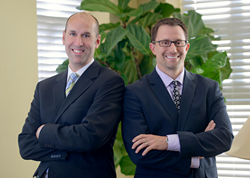 Steven White and Brad Haines are pleased to announce an exclusive promotion for teeth whitening in Cornelius, NC. By taking advantage of this offer, valued at more than $300 per year, new patients can enjoy a lifetime of brighter smiles. With every regular six-month hygiene cleaning from the dentist, patients receive a complimentary professional whitening procedure. Stained or yellowed tooth enamel is common with age, and often, people begin to feel self-conscious about their smile as they notice the changes. Brushing, flossing and professional cleanings from the dentist may keep teeth and gums healthy, but they do not combat stains left by a variety of foods or by drinks such as coffee, tea or wine. Becoming reluctant to smile or laugh in public or to be included in pictures can change how an individual approaches life, but a whitening system may be all that is needed to restore confidence. Determining the best procedure for teeth whitening in Cornelius, NC, is essential for successfully brightening a smile. Kits with whitening gel that can be applied at home may be bought at almost any drugstore, but over-the-counter systems may not brighten teeth evenly. Some stains cannot be eliminated by these substances, and they may also fail to work on certain types of crowns or fillings. People who suffer from root or gum sensitivity often find an at-home application aggravates these issues, as well. At White and Haines Advanced Dentistry, patients may opt for professional teeth whitening in Cornelius, NC, that lightens teeth rapidly and safely. Although the system used in the office is stronger and takes less time than an at-home kit, it is also less likely to irritate because it is monitored closely by the dentist to ensure both success and oral health. It may be impossible to place a value on a beautiful smile, and through the current promotion at White and Haines Advanced Dentistry, new patients do not have to. Individuals can learn more about this offer and the services provided by visiting the website at http://www.drswhiteandhaines.com or call 704-896-9535 to schedule an appointment. White and Haines Advanced Dentistry is a general dental practice offering personalized dental care to patients in Cornelius, NC. Dr. Steven White offers more than 20 years of experience in general and cosmetic dentistry. He has served as a mentor at the Nash Institute for Dental Learning as well as an instructor with the Advanced Aesthetics Program. Dr. Brad Haines was named a Top 40 Dentist Under 40 in Incisal Edge Magazine and brings more than a decade of experience in general and cosmetic dentistry. Drs. White and Haines strive to understand each patient’s unique set of goals to help them reach a healthy smile and they are members of the American Dental Association, Dental Organization for Conscious Sedation and Charlotte Dental Society, among many others. To learn more about Drs. White or Haines or the services they offer at their practice, please visit their website at http://www.drswhiteandhaines.com or call 704-896-9535 to schedule an appointment.